How your hearing works and why exposure to noise levels above 90 dB is dangerous. Industrial Paramedical Services hearing information services. See how hearing works by taking sound waves and converting them into intelligible sounds. Click ear diagram image below to see the complete visual story in large detail. 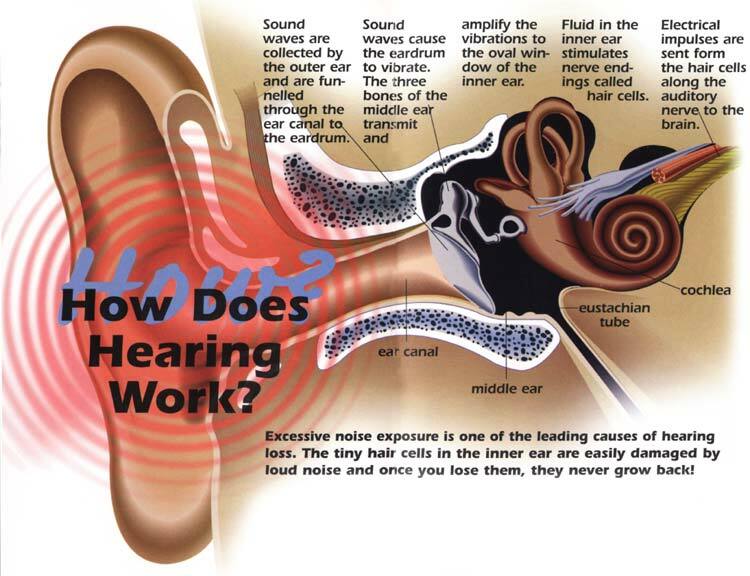 Sound waves are collected by the outer ear and are funneled through the ear canal to the eardrum. Sound waves cause the eardrum to vibrate. The three bones of the middle ear transmit and amplify the vibrations to the oval window of the inner ear. Fluid in the inner ear stimulates nerve endings called hair cells. Electrical impulses are sent from the hair cells along the auditory nerve to the brain. Case Study of Noise-Induced Hearing Loss. 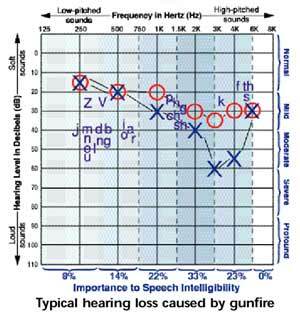 The audiogram below belongs to a man whose hearing loss was caused by gunfire while serving in World War II. After the war, he continued to be active in shooting sports. You can see that his hearing loss is most pronounced in the areas critical to understanding speech. Cannot hear environmental sounds such as game calls, traps releasing, crickets, etc. Keep in mind that conversational speech is approximately 60-65 dB, and the threshold of pain is considered to be 140 dB. According to Dr. William Clark, Ph.D. senior research scientist in charge of the NOISE LABORATORY at the Central Institute for the Deaf in St. Louis, the damage caused by one shot from a .357 magnum pistol, which can expose a shooter to 165 dB for 2msec, is equivalent to over 40 hours in a workplace with a 85dB noise level. Dr. Krammer continues to say that shotgun noise averaged slightly more that 150dB. This is approximately 14dB beyond the threshold of pain, and more than sufficient to cause sudden hearing loss with complications. Krammer adds that sound pressure levels for the various pistols and ammunition tested yielded an average mean of 157.5 dB, which is greater than those previously shown for shotgun and rifle noise levels. Monitoring of the noise environment. If the TWA (Time Weighted Average) noise level is exceeding 85 dB(A), a hearing conservation program is required. Selecting hearing protection devices appropriate for the environment or environments at hand. Several different types of hearing protectors are required to be offered to the employees, in order to introduce a level of personal choice. The employer is responsible to pay for the original equipment as well as replacements. The employees are required to use the hearing protection, and the employer is responsible for the enforcement. Training and educating employees in the proper use of hearing protection, the importance of full time use of hearing protectors when working in a noisy environment. Education and training is considered an essential and ongoing activity. Establishing a baseline audiogram for each noise exposed employee, and annual hearing tests thereafter in order to monitor the effectiveness of the hearing conservation program. Take corrective action when it is concluded that noise induced hearing damage is occurring. Corrective action can entail further education and training in the use and importance of full time use of hearing protection. Using hearing protectors better suited to the environment and the individual. Using administrative controls, which simply means to reduce the exposure time for the employee in question. If these efforts fail, an employee may be transferred to a quieter job. (*) If a threshold shift (hearing damage) exists the noise level at the ear must be 85 dB or less. Overprotection can be a problem! Selecting a high NRR hearing protector for an environment where only good high frequency attenuation is needed, will lead to unnecessary insulation and communications difficulties. Field Attenuation It has been proven in many studies that hearing protectors are not as effective in the field, as the laboratory numbers indicate. In the laboratory the hearing protectors are used correctly, while in many field situations they are not. Employees are either not trained or motivated to make the effort to use the protectors in a correct way. NIOSH recommends a de-rating of 50-70% for earplugs and 25% for earmuffs. Is Your Program Working? How do you know if your hearing conservation program is working? The answer is in your annual audiograms. If they do not show any new noise induced hearing damage, your program is working. Tinnitus is a ringing, buzzing, hissing or other head noise that does not come from an external source. One of the most common causes is exposure to loud noise. Workplace noise can cause hearing loss and tinnitus. If those exposed to loud sound do not wear proper hearing protection devices, they may find they gradually lose their hearing and suffer from tinnitus. Excessively loud sound can also be from music, power tools and chain saws, gunfire, explosives, and motorcycles. Tinnitus may only be an annoyance for some people; however, for others it is a chronic condition, which can cause sleeplessness and lack of concentration. This can be a serious problem that can be avoided by proper precaution. A person who tells a physician about tinnitus may be told to Go home and live with it. This is possible for some, but others need treatment. Feeling there is no cure for tinnitus can turn a benign symptom into a feeling of helplessness and despair. Negative counseling which provides no hope can actually increase the patients perception of tinnitus as he feels it will go on forever, may get worse and cannot be effectively treated. There is help! There is a national organization dedicated to silencing tinnitus. Any person suffering from tinnitus should con tact the American Tinnitus Association (ATA) at 1-800-634-8978. They will be told about tinnitus clinics throughout the United States that work with patients in alleviating tinnitus. Self-help groups sponsored by the ATA provide information and support. American Tinnitus Association has their materials available for the worker who says that tinnitus is causing distress, sleeplessness and affecting his or her work. Provide the employee with ATA s website information, http://www.ata.org. The information on this site is reliable so the individual is not reading anecdotal information from unknown sources.